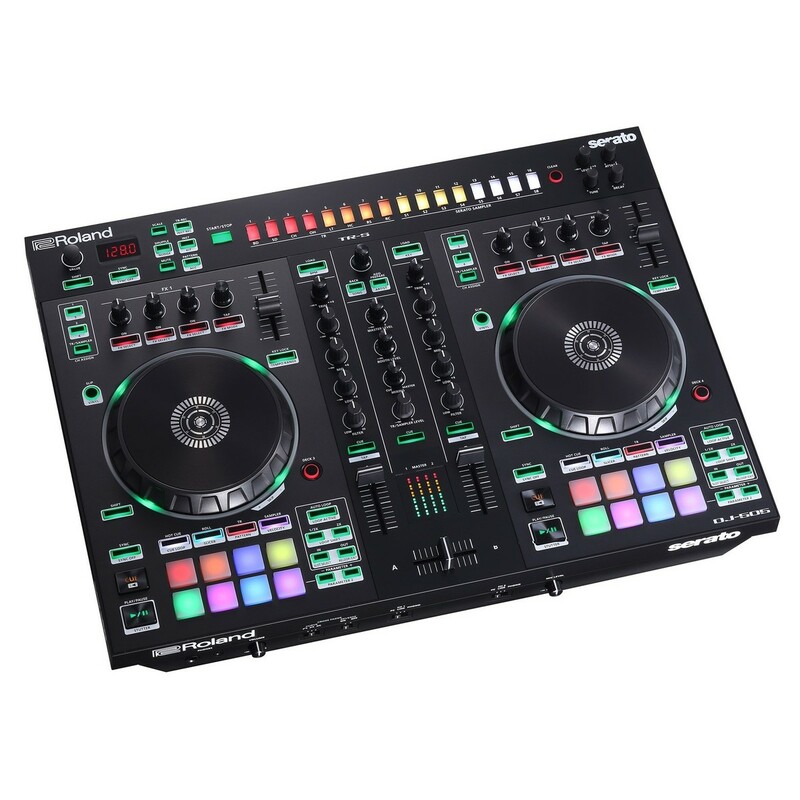 Find out why DJ Mag named this "Best DJ Controller under £600"
The Roland DJ-505 DJ Controller is a professional, two-channel DJ Controller that builds on the success of the its predecessor, the 808. 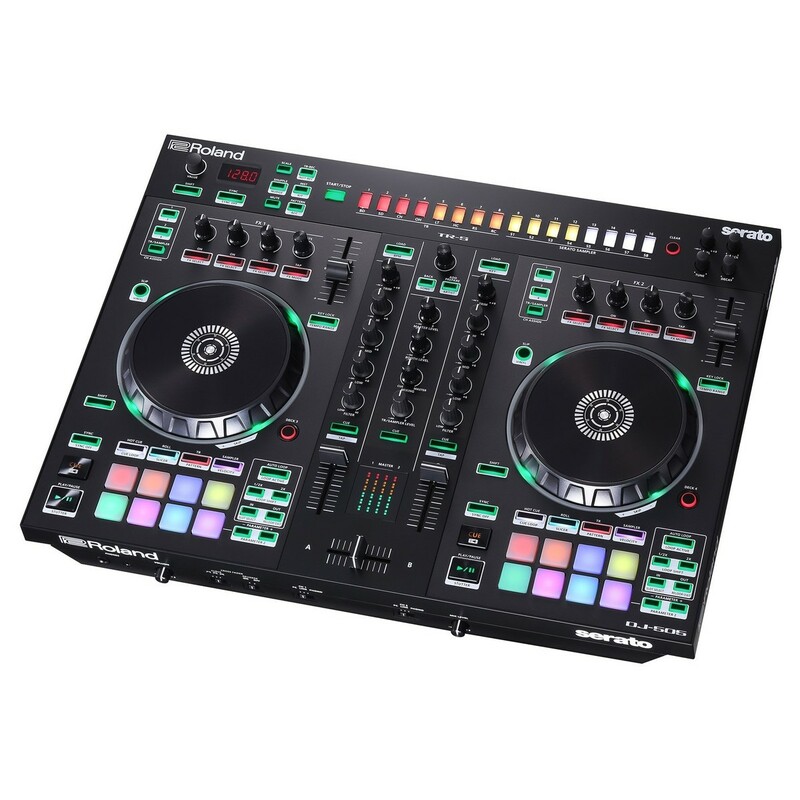 This compact yet versatile DJ controller allows you to use up to four-decks with Serato DJ. 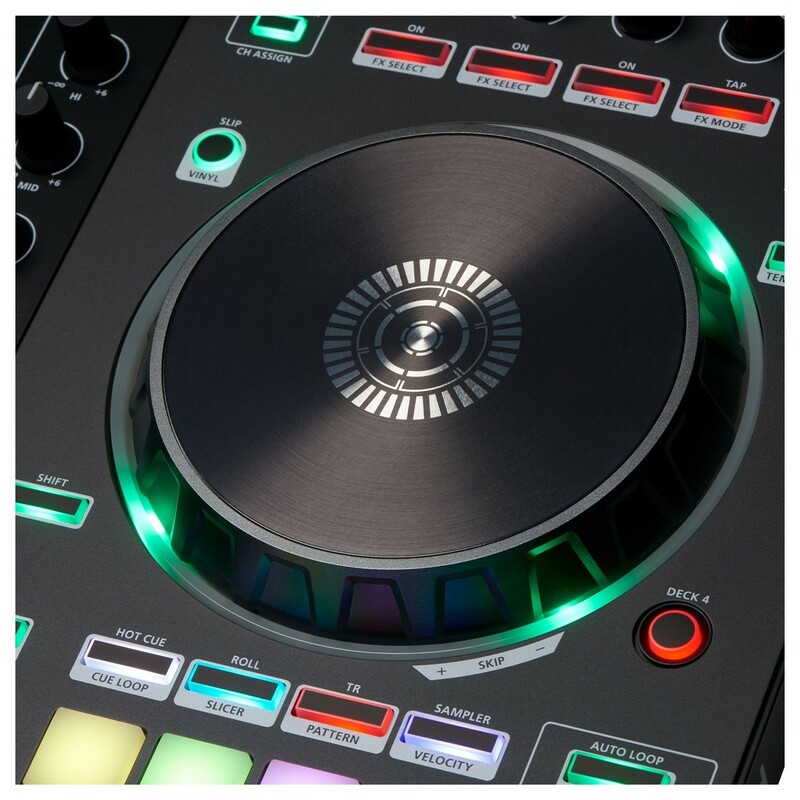 A range of innovative functions and features will take your DJ sets to the next level. The large, low-latency platters are optimised for scratching applications but also provide smooth mixing capabilities. The DJ-505 Controller also features an integrated 16-step sequencer, accompanied by legendary Roland TR kits including sounds from the classic TR-808, TR-909 and TR-606. The Roland DJ-505 also includes eight performance pads for sampling, hot cues and more. 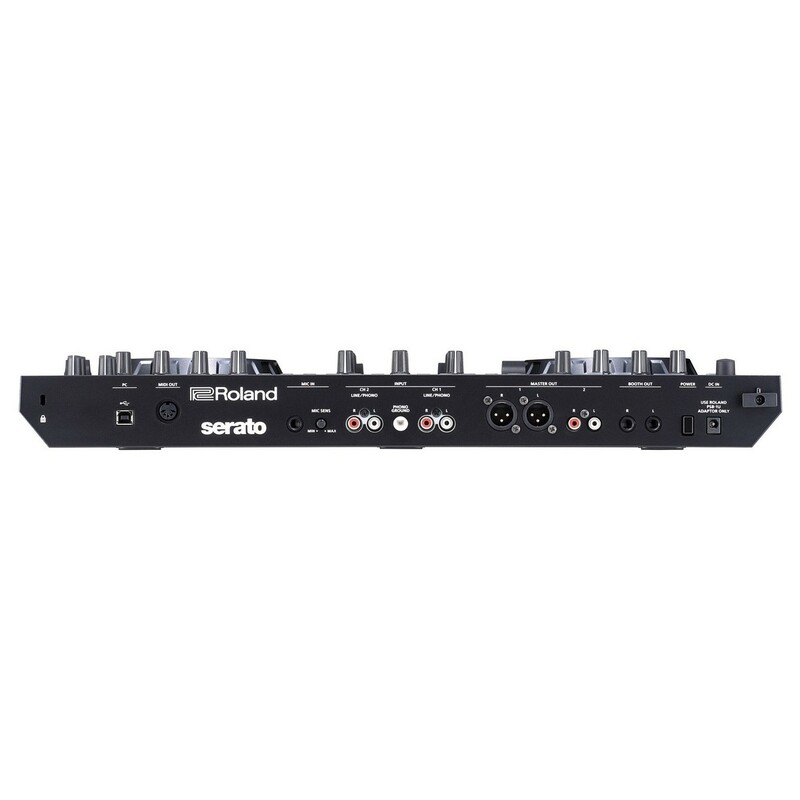 The controller unlocks Serato DJ software and comes complete with the Serato Tool Kit for added versatility. Upgrade Serato DJ to Serato Pro: Serato DJ has now become Serato Pro, packed with a range of new features and a revamped interface. Upgrade your software for FREE by following this link. Serato DJ is now Serato Pro. Serato Pro is a free upgrade for all existing Serato DJ users. Serato Pro is completely redesigned from the ground up, providing a range of new features and rock-solid reliability. The revamped interface has been optimised for high-resolution screens, providing crisp and clean visuals, ideal for Retina, 4K and UHD displays. A new Practice Mode is included, allowing you to mix two tracks together without hardware connected. This allows you to test out your blending and mixing, without the need for a controller. New 64-bit support provides bigger libraries and improved reliability. The new help section provides you with tips, shortcut keys and tutorials for added versatility. 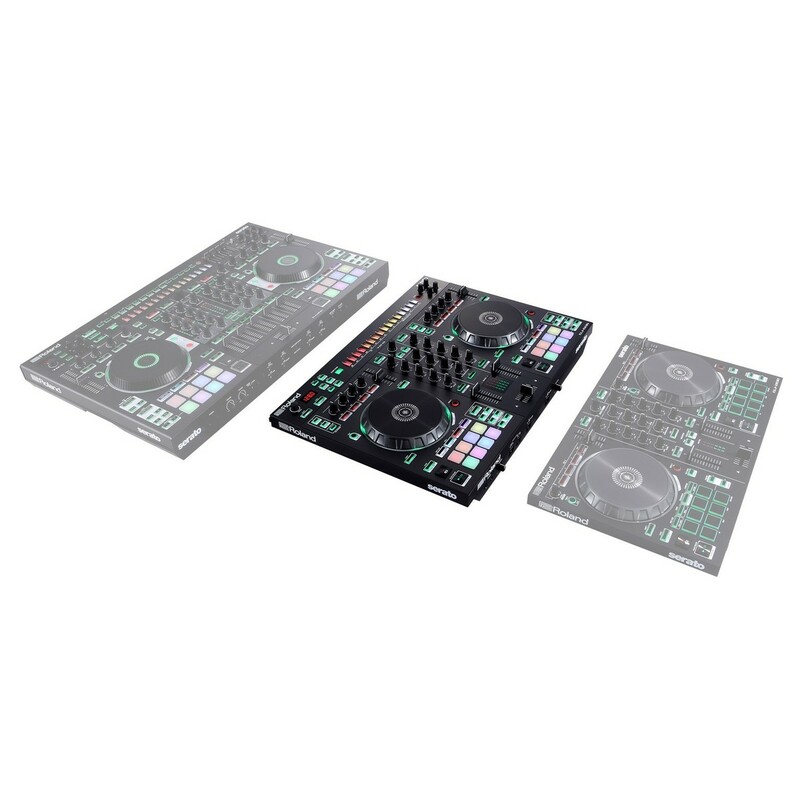 One of the most prominent features of the DJ-505 DJ Controller is the large platters that boast ultra-low latency performance, optimised for scratching applications. The high-performance platters are also ideal for mixing, providing a smooth operation that will allow you to seamlessly blend tracks together. The Roland DJ-505 also boasts exceptional audio fidelity and performance thanks to the high-resolution digital converters, capturing every nuance from your music library in incredible detail. One of the most versatile features of the controller is the integrated mixer, which can be used as a standalone mixer via connections of media players or turntables, via the line and phono inputs. 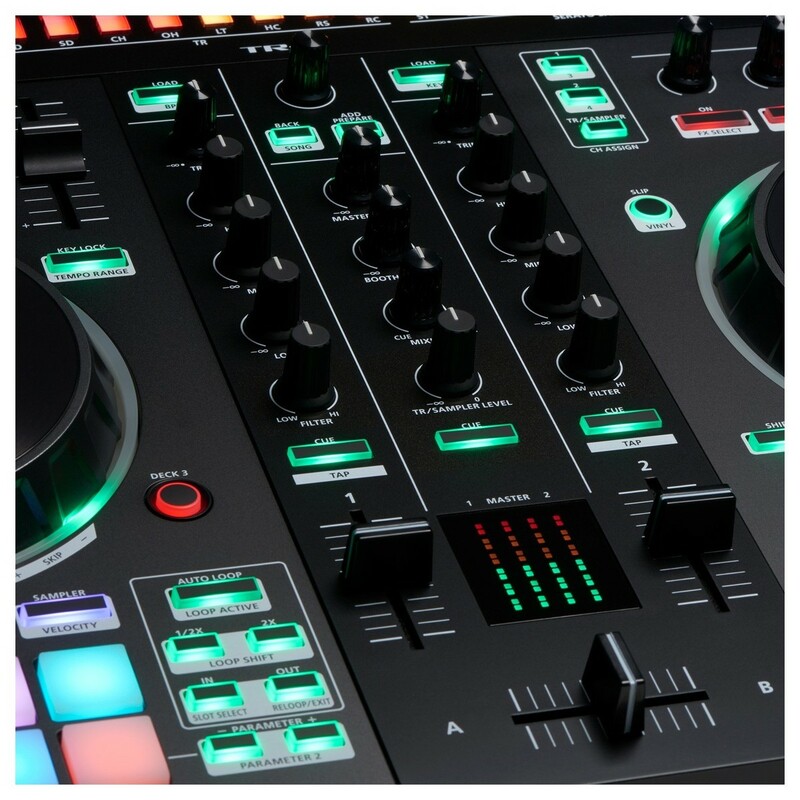 This high-end DJ controller is suited for intermediate and professional DJs boasting a range of performance controls and parameters designed to take your mixing capabilities to the next level. What sets the Roland DJ-505 DJ Controller apart from the rest on the market is its range of performance enhancing features as well as the classic 16-step sequencer. The 16-step sequencer is inspired by the Roland AIRA module, providing a class layout which can trigger either the Serato Sampler or the TR drum sounds that come complete with the controller. 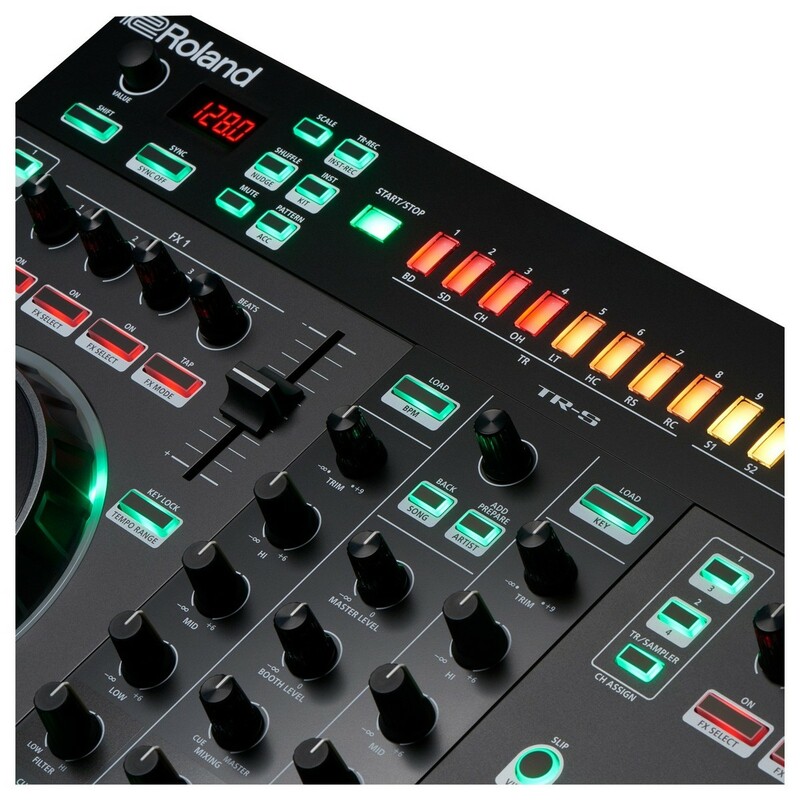 Roland have incorporated fully editable drum kits from Roland classic Tr-808, 909, 606 and 707 modules, revitalised using the advanced ACB (Analog Circuit Behaviour) technology to recapture the essence of the sounds. 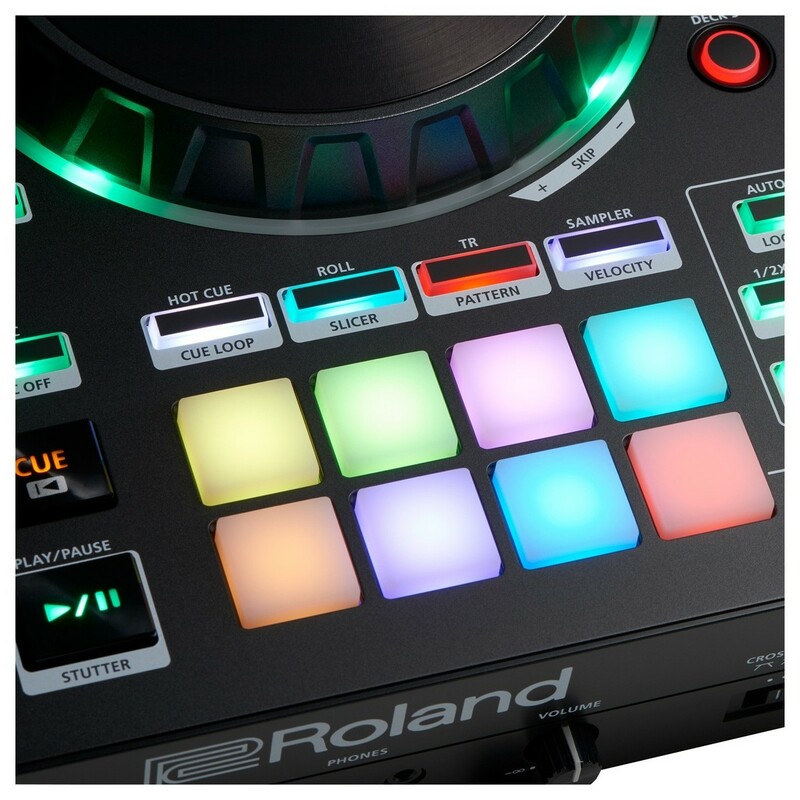 This virtually gives you some of the most renowned Roland Drum Machines, housed in this versatile DJ controller. From TR-909's instantly-recognisable hi-hats to booming kick drums from the 808 kits, the TR kits are some of the most popular drum sounds in the music industry. The sounds have been recreated in immense detail and can be used within the step sequencer, allowing you to create drum beats and patterns on the fly. As well as incorporating some of the most well-known drum machine sounds, the DJ-505 Controller also boasts eight performance pads which can be used for sampling, triggering hot cues, effects and more. The illuminated pads can be used in conjunction with the integrated sequencer to create some interesting patterns and performance effects. You can use the performance pads and the sequencer together to create custom transitions, add drum patterns into your mixes or even add additional percussion into classic tracks to remix them live. 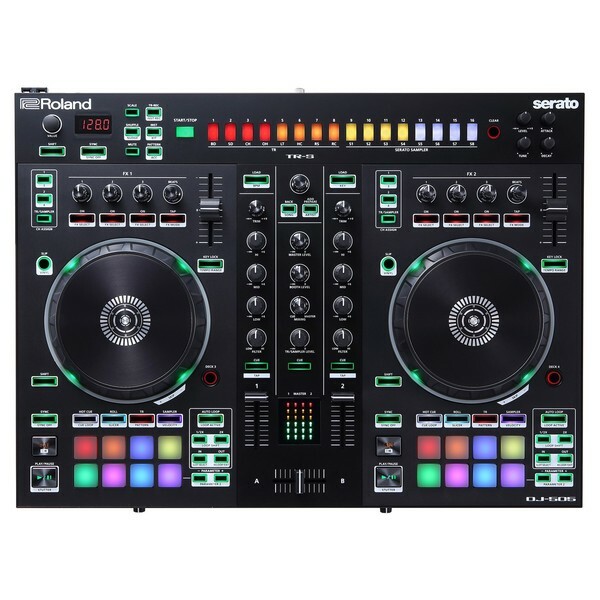 Each channel of the controller features dedicated mixing controls as well as being able to use filter via Serato FX. The streamlined and robust design makes the DJ-505 ideal for the DJ on the move, with protruding sides allowing you to transport your controller with ease. The large low-latency platters feature a brush aluminium top plate as well as illuminated outer rings for use in low light environments that provide information on the status of the deck. The Roland DJ-505 also provides a range of versatile connectivity including a MIDI output that allows you to sync external equipment with Serato DJ, as well as the TR-S sequencer. A microphone input is also included, accompanied by high-grade effects such as gate, hi-pass, reverb and echo FX. Balanced XLR outputs allow you to connect your controller directly to PA systems, as well as including a Booth Output and separate headphone output for monitoring your mixes. 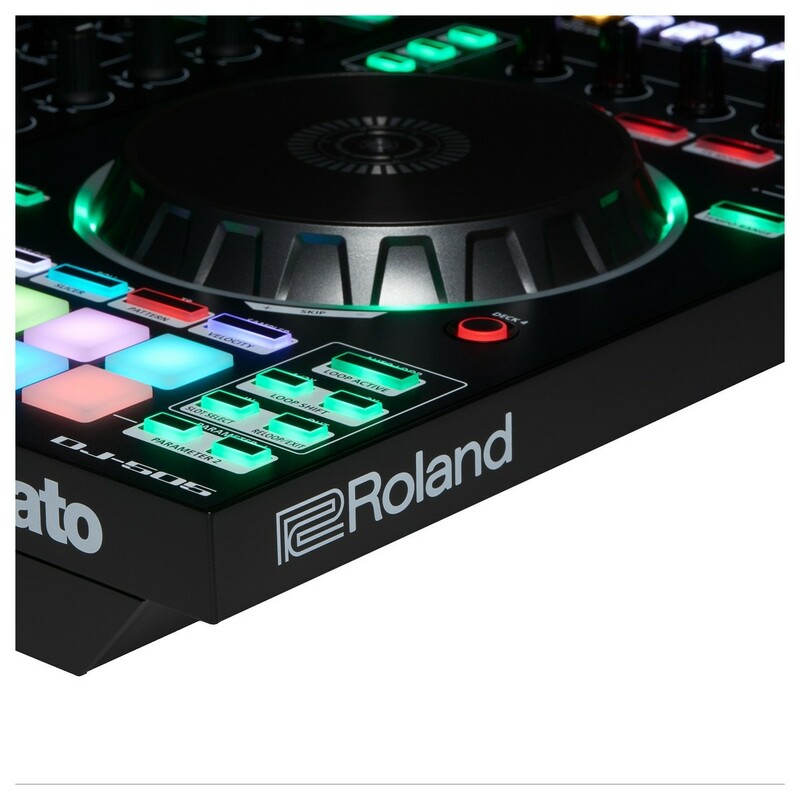 Designed for use with Serato DJ, the controller unlocks the software and comes complete with Serato Tool Kit licences providing added functionality for your software.